With the wiring proceeding apace and the garage rough-in (and fit off, since I'm not lining the walls) likely to be finished this Friday, I'm getting ready to pull the trigger on the solar system components. So that now leaves me to figure out where all the components are going to live. Firstly, the solar panels. In consultation with Nenad and after observing the roof's solar access and shading at the winter solstice, we've decided that the best orientation for the panels is (not surprisingly) due north. 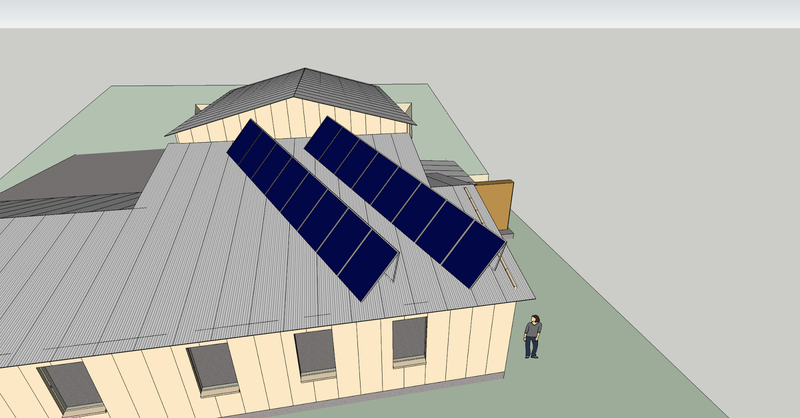 We had discussed splitting the array in half and pointing one half NNE and the other NNW in order to maximise the morning and afternoon sun, but I can't really find a way to make all the panels fit on the roof in a way that looks any good, and is easy to do electrically. So, due north it is. 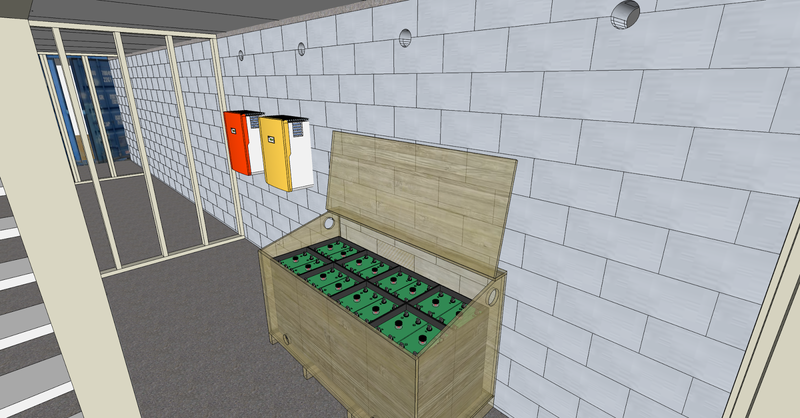 The other bit of modelling I've been doing is designing a battery enclosure, now that I've settled on the brand and type of battery. Because flooded lead/acid batteries produce oxygen and hydrogen gas when they are charged, the batteries must be vented to the atmosphere to prevent the possibility of a rather nasty combustion event. Electrickery plus explosive gas equals ... an expensive insurance claim! The original intent was to vent the battery box naturally by ducting it to the holes I had bored in the retaining wall, but according to the regulations those holes give us about 10% of the surface area we'd need to vent the batteries at the charge rate we can sustain. Rather than run a big duct out through the pump room, it's on to plan B: Forced ventilation. The SMA inverter/charger I'm using has a neat feature - battery room fan control. When it detects that the batteries are gassing (through a combination of temperature sensor and knowing the charge current) it can switch on a fan to ventilate the batteries. According to the regs I "only" need to provide 20 litres per second of airflow for the 140A charge current we can potentially deliver (even though we'll struggle to generate 100A between the panels and generator) and I've managed to source some tricky little 240V fans (like the ones in a computer) which only draw 4W each, but use that to move about 18 litres of air per second. So I'll mount two of these on the outside of the enclosure blowing in (important detail that - it wouldn't be a good idea to have them sucking the gas out, as any sparks in the motor would trigger the above insurance event) and duct the box out through the holes in the retaining wall. There's still a bit of juggling to do with the location of the box and inverters, to make room for switch boards but this is roughly where it'll all live.